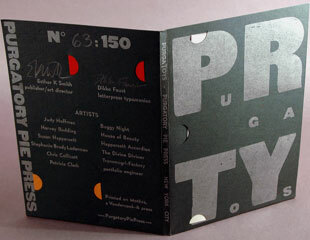 Richard Goodman, A Fine Press in the City: "Purgatory Pie Press is a husband and wife affair, with Dikko Faust the typographer and printer, and Esther Smith, his wife, the designer. The press is located in TriBeCa, in lower New York City, in rather cramped quarters that contain a small Vandercook Press, drawers of type safely tucked away, and everything else very much demonstrating various works in progress in different states of completion. ... The press’s work can probably be divided into two large categories: traditional books and accordion books. 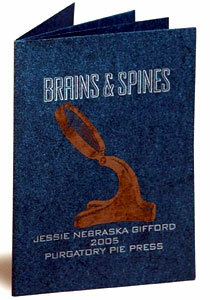 ... All Purgatory Pie Press books are collaborations. Esther Smith designs the books; Dikko Faust sets the metal and wood type by hand and prints on a 1930s Vandercook 4 letterpress. 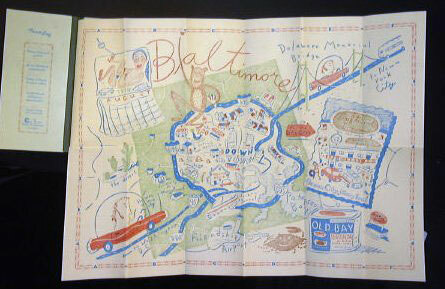 All are hand-stitched, hand-bound, signed, numbered, limited editions." New York: Purgatory Pie Press, 2010. Edition of 200. 4.5 x 4.5"; 12 coasters. Letterpress and relief printed. Shapes of individual coasters vary. In a hand-printed presentation box. Each coaster signed and numbered. Purgatory Pie Press: "Purgatory Pie Press (New York, NY) consists of the husband and wife team Dikko Faust and Esther K. Smith. Faust hand-sets wood and metal type and experiments with letterpress as a printmaking medium. Smith edits, designs, and hand-sews books. 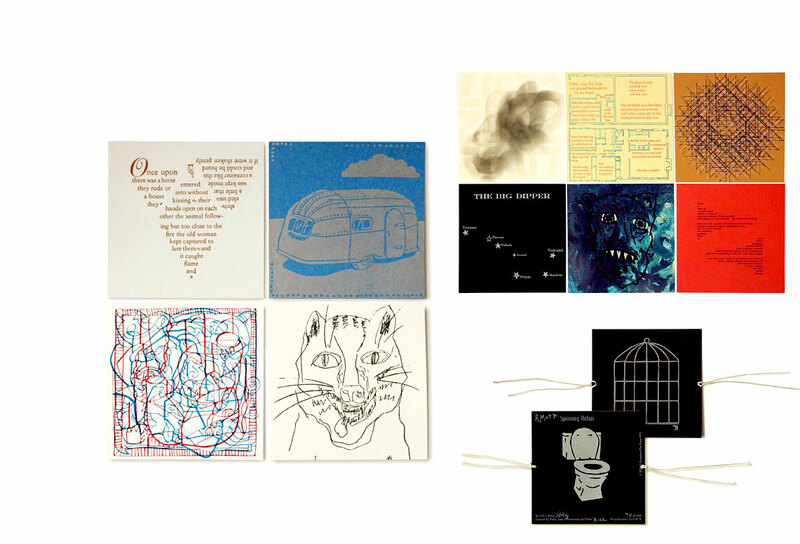 Faust and Smith collaborate with other artists and writers to create artists books, postcards, coasters and a variety of hand printed ephemera." 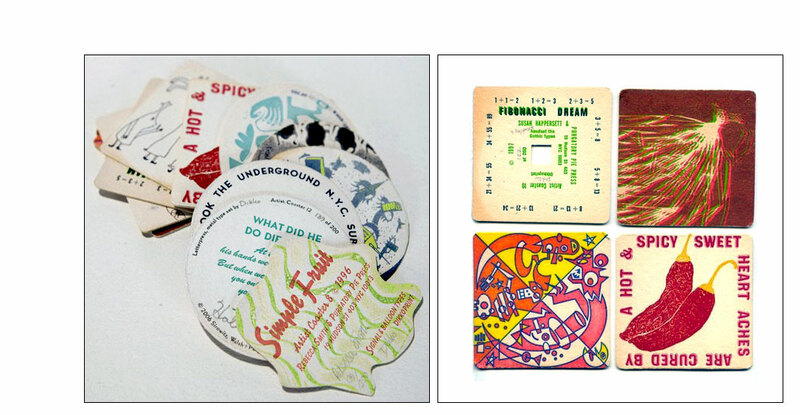 Originally a subscription series, each coaster was printed in an edition of 200. Coaster #1 came in 1995, Coaster #12 in 2005. In 2010, 96 boxed sets were assembled, each containing all twelve coasters. New York: Purgatory Pie Press, 2002. 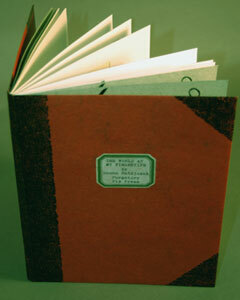 6.5 x 6" bound do-si-do so that each book can be the accessed from the "front." Uses linoleum illustrations. Printed letterpress. Two stories by Georgia Luna Smith Faust designed into one book. In "On The A Train" the artist is gripped by a mysterious hand on the crowded train. She develops six different endings to this unsettling event. "Everything Falls into Place" is a spunky piece told by a sixteen year old New York City girl. New York: Purgatory Pie Press, 1996. Edition of 61. 12 x 9" closed, opens to 72"; 6 pages. Accordion structure with pages attached at both ends to hand-treated masonite covers. Letterpress topographic relief on torn Rosaspina cream paper. Types: Gothic wood & Corvinus. Letterpress topographic relief by Dikko Faust. Design & structure by Esther K. Smith. Voir Dire Maelstrom – collaboration between modernist artist (most know for his paintings) John Adams Griefen and book artists Esther K. Smith and Dikko Faust. Can you sit on this jury? Unbiased? Non-narrative art? Modern art? Toward this … is it art? 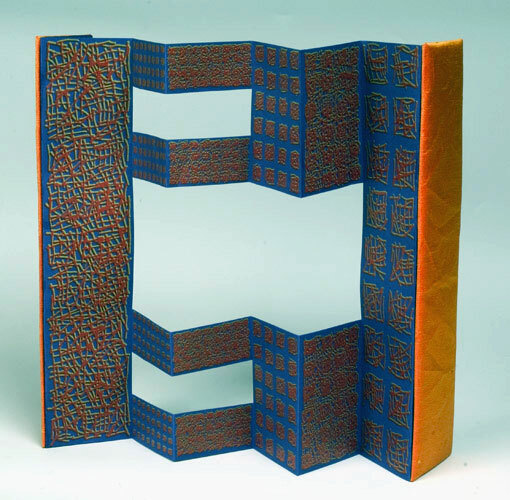 Richard Goodman, "A Fine Press in the City," Fine Books & Collections (September 2009): "... there is Voir Dire Maelstrom (1996), by John Adams Griefen, a large, appealing accordion book made of hand-treated masonite covers with hand-torn edges and pop-ups. It’s difficult to discern the author’s full contribution in this case, because the total extent of the text is the title. Nevertheless, the book somehow leaves you both entertained and bothered." New York: Purgatory Pie Press, 1994. Edition of 150. 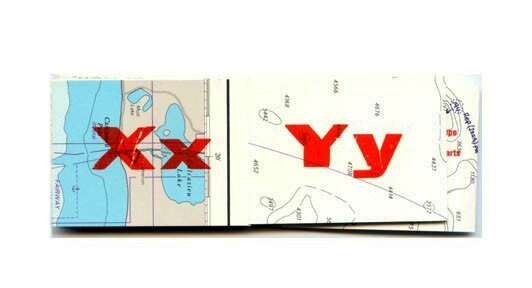 18.75 x 26" map folds to 9.4 x 4.4 x .25 guide. Types used Kabel & Kaufmann Bold with green, blue & red on pale yellow Bodleian. Signed by Ratajczak; Hartland; Esther K. Smith; and Dikko Faust. Join Arthur in his journey through life "Points West." Arthur is "thinking of driving cross-country in his Corolla... He gets a bunch of road maps from gas stations. He files them in the glove compartment." Travelog tells the story of a rather sad-sack parole officer named Arthur, whose movements are charted in a jaunty fold-out map. New York: Purgatory Pie Press, 1989. Edition of 150. 4.25 x 3. 375"; 26 pages. Accordion. Handset and printed by Dikko Faust in Brush, Gillies Gothic, Ernhard Gothic, Eagle Bold and Anon Wood types. Printed on Prevence and Rives de Lin papers. Lexicography and design by Esther K. Smith. 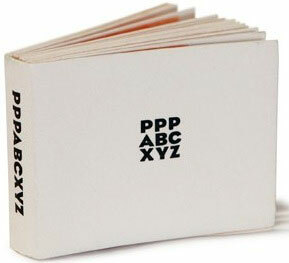 An alphabet book from Purgatory Pie Press printed in a multitude of fonts. Comes in two paper versions - a version on white and one on recycled paper. Each version an edition of 150. New York: Purgatory Pie Press, 1986. Edition of 200. 12 x 6"; 16 pages. Printed letterpress using Weiss Roman foundry type on Phoenix Imperial Paper. Profile printed in two-tone Purgacolor. Background printed from Dikko-made sandpaper. 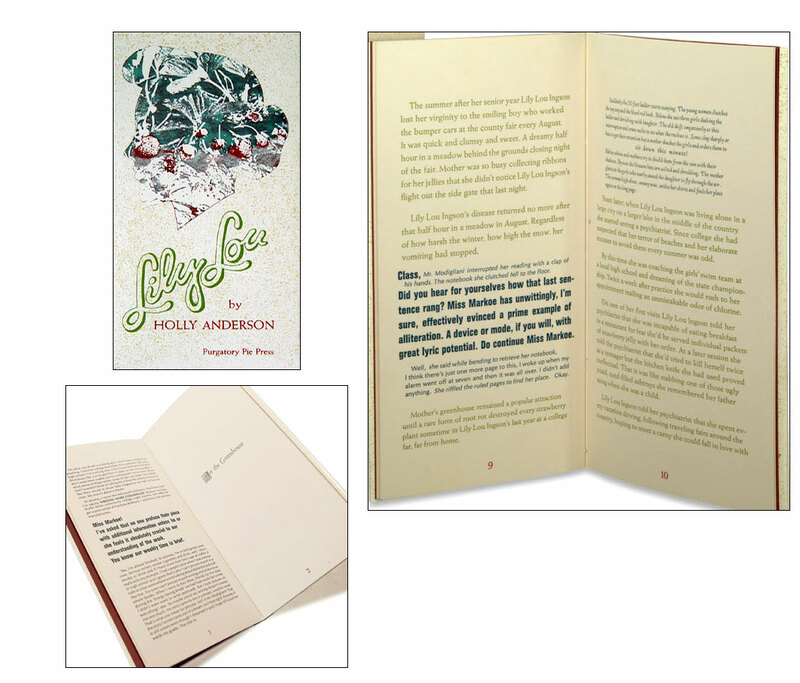 Bound in paper-covered boards with illustrated dust jacket. Signed by Anderson. Lily Lou is a quirky tale about a 17-year-old girl who vomits sand but is cured from that affliction when she loses her virginity. Holly Anderson is a New York poet and writer. Susan Happersett has plotted numerical properties that allow her to study the characteristics of functions, sequences and series in a visual language. Using the Fibonacci Sequence which is derived by adding each new number in the series to the previous number (i.e., 2, 3, 5, 8, 13, 21...), she has developed several books demonstrating these characteristics via visual arts. New York: Purgatory Pie Press, 2012. Edition of 40. 7" x 7"; 8 interlocking sculptural interactive accordions. 4 pieces, each 7" x 7". Standing, lined up: 21" x 7" x 4". Printed on Nepali Lokta paper in Futura handset type. Housed in a black cardstock box titled in gilt on the spine panel. Signed by designer, printer, and artist. Susan Happersett: "My Chaos Theory drawings illustrate the underlying patterns and order within what appears at first to be complete disorder or 'Chaos.' I achieve this effect by making a simple pattern through numerous iterations using a stencil. The extra space in the stencil that allows my pen to move freely creates a small margin of error which over the course of the iterations creates the cloud like chaotic patterns"
Susan Happersett, blog: "My fascination with mathematics and my love of visual arts has led me on a journey to build a link between mathematics and drawing. It has become my mission to express the intrinsic aesthetic value of Mathematics in a purely visual language. I use a number of graphing and geometric plotting techniques to examine the aesthetic characteristics of functions, sequences, and series in a visual language. My drawings are an intense accumulation of lines and mark making resulting from my predisposition to counting. Through the years my drawing has become a type of meditation. "In my Chaos Theory-inspired drawings, I illustrate the order and pattern within the seemingly chaotic mass of lines. I spent many months making a stop motion video of the creation of a Chaos drawing. I would have to step away from the drawing after every line. This pause in drawing made me look at the work in progress and at numerous times I realized that the drawing was visually interesting throughout its creation. So I decided to make a book where you could see the drawing at different stages. 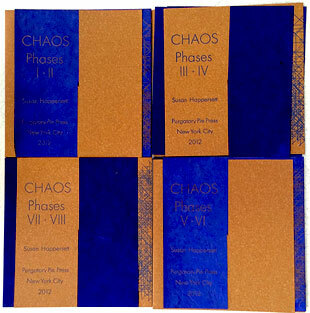 I created a series of hand-drawn books, but my most recent Chaos project is a letterpressed edition Box of Chaos published by Purgatory Pie Press in NYC. 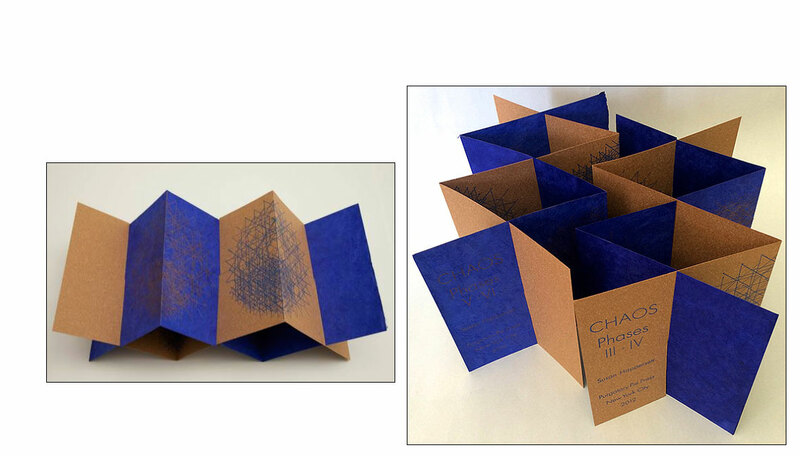 Box of Chaos consists of four folded paper structures illustrating 8 phases of chaos." New York, New York: Purgatory Pie Press, 2006. Edition of 123. 7.125 x 7.125"; 10 pages. Progression of hand generated flowers presented in a combination accordion-and-sewn binding that displays the Fibonacci Sequence in action. Wrapped in a folded cardstock case printed with the same flowers. Weiss Roman, Sylvan, Gallia, Raleigh Cursive, Modern #20, and Derby types. Arches and St. Armand paper. Design and structure by Esther K. Smith; letterpress and hand typography by Dikko Faust; hand generated flowers by Susan Happersett. 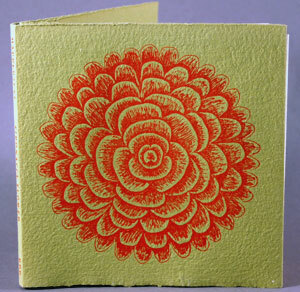 Susan Happersett: "Fibonacci Flower is an artist book made up of letterpress prints of drawings. In each drawing I have mathematically generated a flower, using the Fibonacci Sequence to determine the number of petals in the outer ring of each bloom. On the first page there is one petal inside on petal. On the next page, the flower grows with a new ring of two petals. The next page [shows a] three-petal ring, then five, eight, up to 34 petals. Fibonacci Flower has a unique structure that is a combination of an accordion and a sewn binding, that allows the viewer to see two or three consecutive Fibonacci flowers at the same time." New York: Purgatory Pie Press, 2004. Edition of 100. 2 x 9" with six accordion cut-out pages. Bound in orange silk covers. Housed in Blue Tiziano paper slipcase with orange and yellow titles. Drawings and research by Susan Happersett. Designed by Esther K. Smith. Hand typography and letterpress printmaking by Dikko Faust. This lovely orange and blue tall book includes quotes from a number of famous and infamous people on infinity including Georg Cantor. Cantor, considered a mathematical heretic at the time, developed Set Theory and his now-famous fractal Cantor Set in the 1870's. No sensible magnitude is infinite. I can't help it, in spite of myself, infinity torments me. New York: Purgatory Pie Press, 2001. Edition of 100. 3-D object of one paper Möbius strip in box (15 x 7 x 7 cm). Strip of stiff brown paper with black markings on one side and white markings on the other, creased into accordion folds and glued together at the ends to form a Möbius strip. Features black markings on one side and white markings on the other side of a brown strip, with 13 markings, or strokes, per grid square. A Möbius strip, or band, is the one-sided surface that results from joining together the two ends of a long strip of paper after twisting one end 180 degrees. The new version of Happersett's Möbius accordion features black markings on one side and white markings on the other side of a brown strip, with 13 markings, or strokes, per box. A novel twist on the Möbius strip which Happersett describes as a Möbius accordion. Each unfolded copy comes with a droll certificate of authenticity along with assembly instructions and the mandatory warning that the product is a mind boggling "Möbius device." New York: Purgatory Pie Press, 1999. Edition of 216. 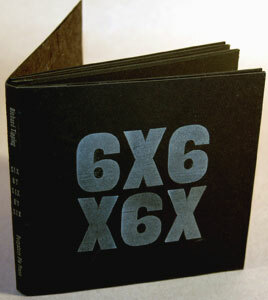 6 x 6"; 8 pages. 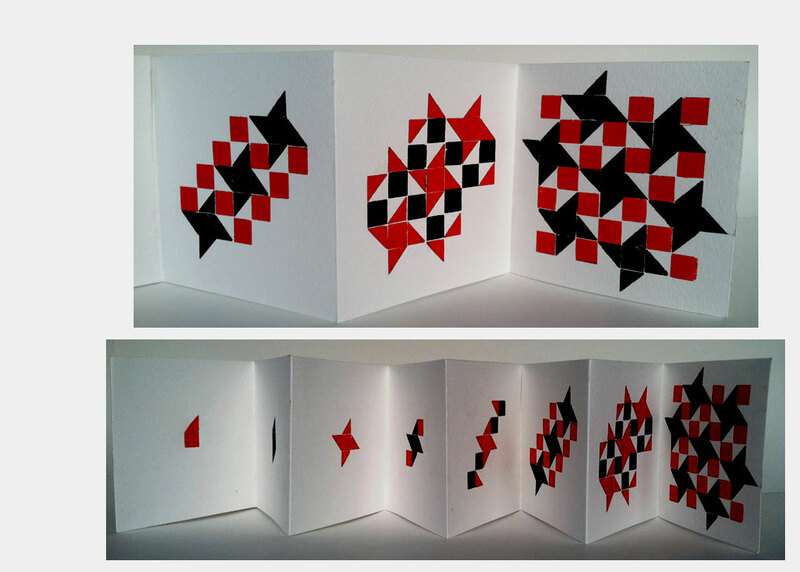 Accordion book. Handset wood and metal type printed on black museum board. Titles printed on front and back covers. Concrete poetry by Australian poet Richard Tipping. Richard Tipping, web site: "Richard Kelly Tipping was born in Adelaide, South Australia, in 1949 and studied in humanities at Flinders University. His doctorate from the University of Technology Sydney (2007) is titled Word Art Works: visual poetry and textual objects. He was guest editor for Artlink magazine’s special issue Word as Art in 2007. He has published five books of poetry. ... He continues to explore the physical qualities of written language, making art with words and getting poetry off the page and into the streets." New York: Purgatory Pie Press, 1988. Edition of 150. 8.75 x 6.5", 16 pages. Letterpress printed on Rosaspina and Kitikata papers. Types: Bodoni, Bookman, Caslon, Franklin. In stiff boards with red and black folded over wrapper. Printed by Dikko Faust. Designed by Esther K. Smith. Signed and numbered by Smith and Faust. Donna Ratajezak's Travelog was also published by Purgatory Pie Press. New York: Purgatory Pie Press, 2001. Edition of 150. 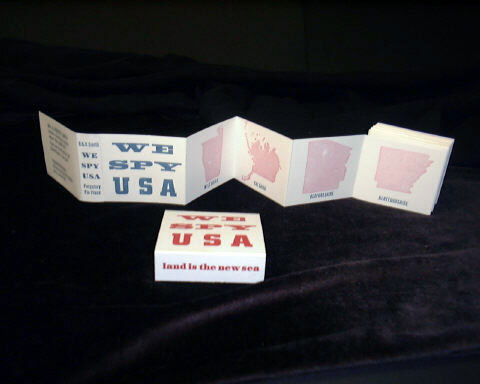 9.5 x 6.75" folded wrapper that holds the five toys in individual tabs made into the paper. The Happersett Accordion by Susan Happersett (2000), a single surface Moebius strip which folds to reveal two distinct chiaroscuro faces. The Divine Diviner by Stephanie Brody Lederman (2001), six "pages" hanging by a thread. Magic Postcard. 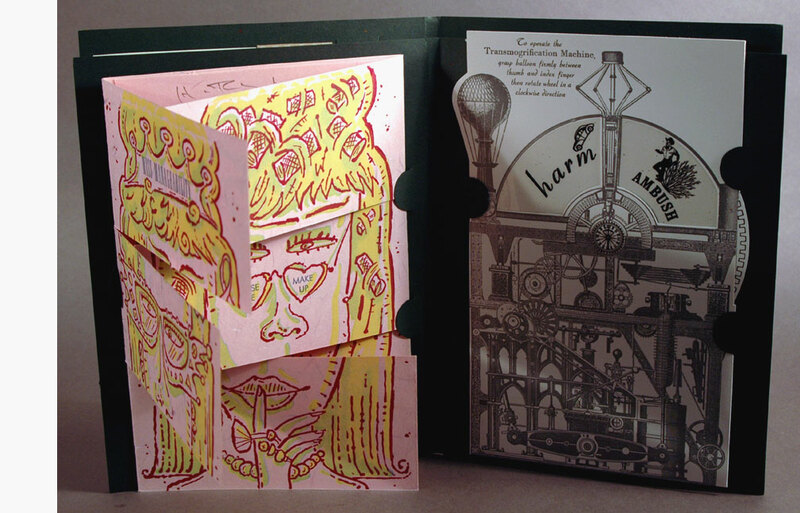 Transmorgri-Factory by Chris Collicott (2004), a magic wheel postcard. New York: Purgatory Pie Press, 1992. Edition of 250. Boxed set of five juxtapositional triptychs. 7 x 5" tracts open to 7 x 15". In paper box 7 x 5 x 1/2" by Lauren Rowland which is Day-Glo Rococo hand marbled over pied wood type. Signed and numbered. Concept and design by Esther K. Smith. Fascinated with those folded religious pamphlets, Esther K. Smith envisioned Artist tracts. 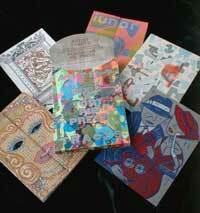 In 2004 Purgatory Pie Press began a series of Insta-Books. 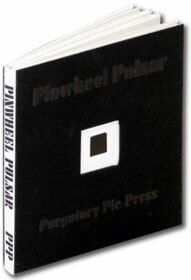 New York: Purgatory Pie Press, 2005. Edition of 200. 4.75 x 6.75"; 8 pages. One sheet book. Letterpress. Handset metal types: Agency Gothic Open, Bank Gothic and Horizon Italic. 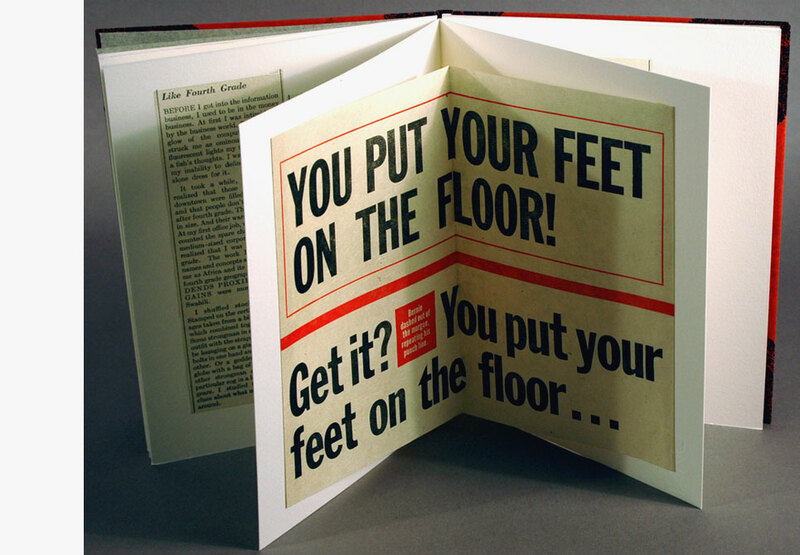 Jessie Nebraska Gifford (1932) artist and printmaker collaborated with Purgatory Pie Press to produce this one sheet editioned book as part of her MS Series. The book was conceived by the artist; the basis of the images and text are MRI scans of her brain and spine. Esther K. Smith composed the poetic text as well as the book design. Dikko Faust handset the text from metal type and made photopolymer plates from Gifford's scans. New York: Purgatory Pie Press, 2003. Edition of 30. 4 coasters, each 4 x 4". Both sides of each coaster letterpress printed by Dikko Faust. Band title slip on with colophon. 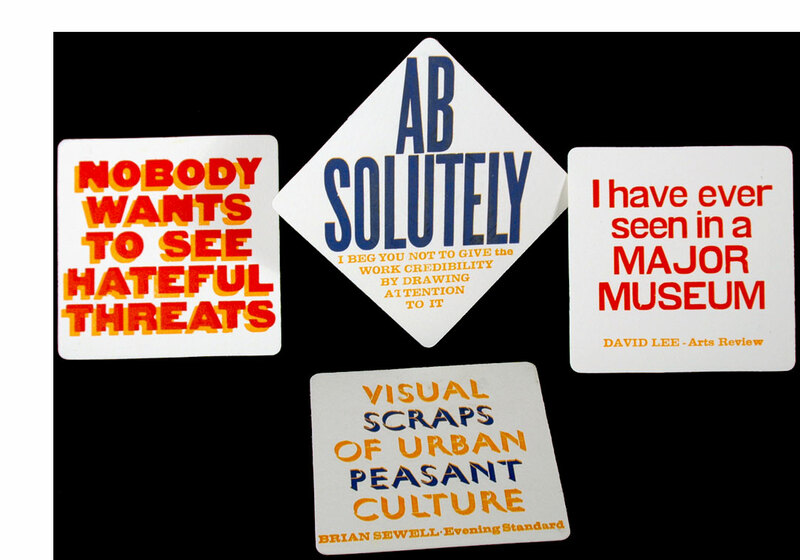 Bob and Roberta Smith versus the London Tabloid art critics. Bob & Roberta Smith is the pseudonym of British contemporary artist Patrick Brill (born 1963). 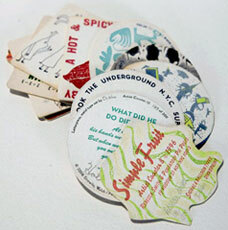 This set of four coasters introduces a new typeface by Dikko. This is one of several collaborations between Brill and Purgatory Pie Press. Aesthetica Magazine, July 2009: "He studied at the University of Reading and Goldsmiths College London. [Patrick Brill] invites us to question high art, and the role that aesthetic elitism has to play in society today. At the core of his practice Bob & Roberta Smith asserts that art can and should be an essential tool in the democratic process. He shows work internationally, with recent shows in Italy and the United States, and at Tate Britain." New York: Purgatory Pie Press, 1998. Edition of 100. 2.25 x 2.12"; 56 pages. Linocuts and letterpress printing by Dikko Faust. One sheet accordion miniature. Folded to form wrapper. Housed in paper slip-on open ended band wrapper. Designed by Esther K. Smith. 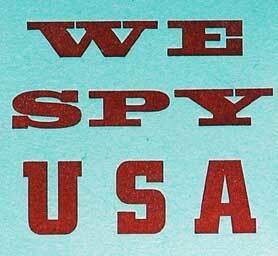 Linoleum cuts of the 54 [ask PPP] United States as identified by Londoners, Bob and Roberta Smith. The shape of each US state is printed on a page and underneath the identification by the Smiths, which actually is a gross misidentification. For example, Alabama is identified as Wiltshire, California is Cambridgeshire. Zany nonsense? Or inspired word play? New York: Purgatory Pie Press, 1994. 7 x 7" clear plastic sleeve with 45 rpm record slipped in a paper record sleeve. Letterpress printed by Dikko Faust. Text and labels designed by the artist. Designed by Esther K. Smith. Signed by the artist. 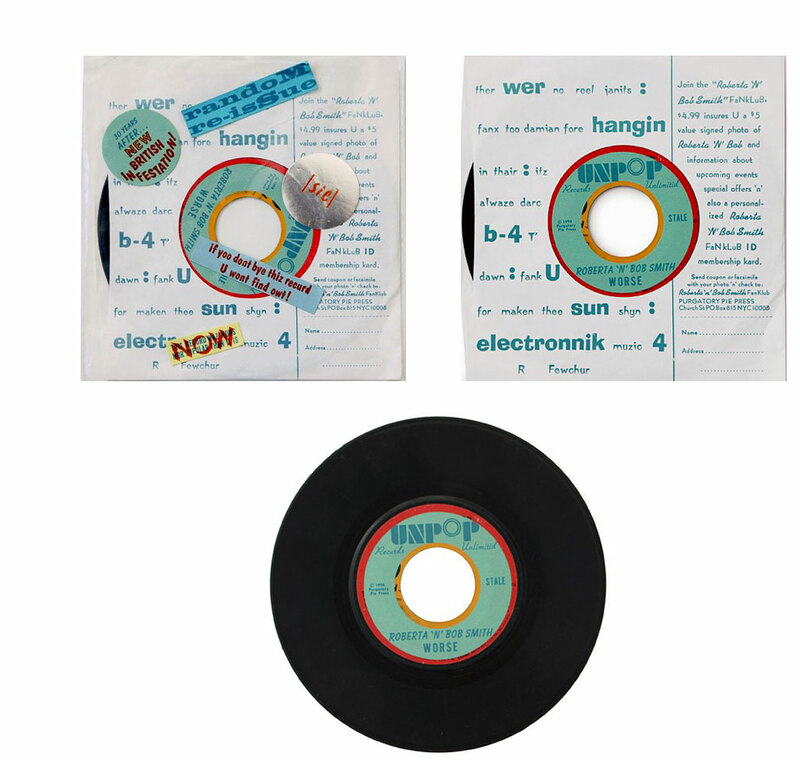 An original 45 rpm (of unknown titles) is appropriated and revisioned here by applying new labels. 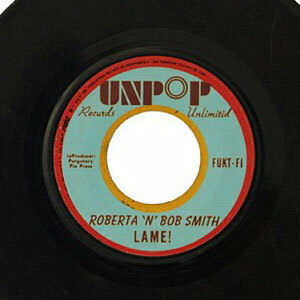 The original labels are covered by letterpress printed labels reading "Roberta 'n' Bob Smith, Lame!" on one side and "Roberta 'n' Bob Smith, Worse" on the other. 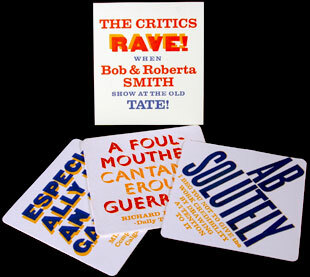 Bob & Roberta Smith is the pseudonym of British contemporary artist Patrick Brill (born 1963). Brill also performs music, often with a group known as The Ken Ardley Playboys, who had their first 45 released by Billy Childish on his label Hangman Records, a British independent label. 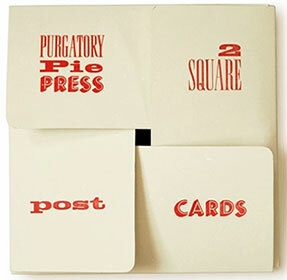 Center of Book Arts, New York: "Purgatory Pie Press made its first Postcard Subscription in 1982. Collaborating with a different artist or writer each month, they continued their series for ten years and then continued with projects like a coaster subscription, Artist Tracts, Purga-Toys, and Instant Books. They began making postcards again in 2006 with their square postcards series. After 3 series of those, they moved to elongated postcards." Esther Smith, AIGA interview 2008: "I wanted to collaborate with and publish writers and artists who were not well known – New York, especially in the early '80s when I moved here, had tons of artists – so we would meet them everywhere, and if we liked their work and it seemed like it would translate well to letterpress, we would try a postcard with them. Michael Bartalos was the first illustrator we worked with and he introduced us to other illustrators. We collaborated with the illustrators as artists. We didn't give them assignments, but looked at their work to see what they were interested in doing. Most of them were not well known when we started working with them." New York: Purgatory Pie Press, 2010. Edition of 150. 9" x 4"; 12 cards. Handset type and letterpress printed. Each postcard signed and numbered by the artist. Laid in printed envelope-style paper case with Velcro closure. Signed and numbered on the case by Faust and Smith. 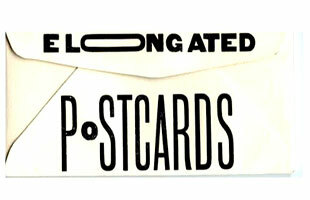 Elongated Postcards was the 2009 annual post card series of Purgatory Pie Press. New York: Purgatory Pie Press, 2006. Edition of 144. 5.5" x 5.5"; 12 postcards. Handset type and letterpress printed. Each postcard signed and numbered by the artist. 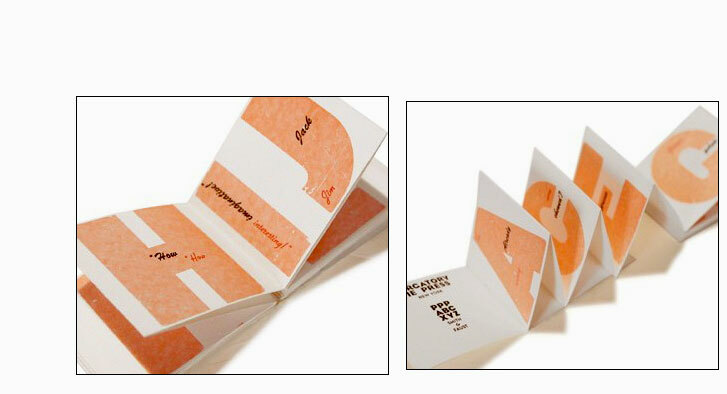 Laid in printed paper case with fold over flaps. Signed and numbered on the case by Faust and Smith. 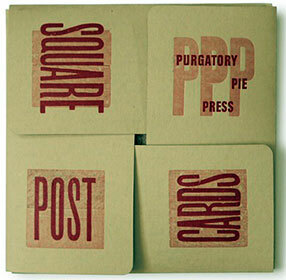 Square Postcards was the annual subscription series for Purgatory Pie Press in 2006. New York: Purgatory Pie Press, 2011. Edition of 40. 3" x 2 .5" closed, extends to 104.25"; 32 pages including self-wraps. 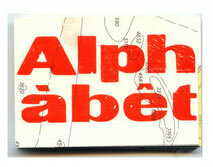 Letterpress with French sans serif extra wide wood type circa 1925 and printed on obsolete sea charts by Dikko Faust. Design by Esther K Smith. Signed and number by the artists. One folded continuous sheet of obsolete sea charts. Faust used extra-wide French wood type, circa 1925, to letterpress print the alphabet, printing both upper and lower case of each letter. New York: Purgatory Pie Press, 2004. Edition of 200. 7 x 4. 75" closed, unfolds to 14 x 19". One sheet book. Printed letterpress on Bodleian paper with metal typefaces: Gillies Gothic, Kaufman Bold, Balloon, Craw Clarendon, Globe Gothic, Signal, Egyptian Wide, Tower, Folio Bold Condensed, Dom Casual, City Compact Bold, Brush, Wedge Gothic, Corvinus. Handcut linoleum images. The first book in Purgatory Pie's InstaBook series. The press calls this an inside out book. It is a one sheet book featuring gruesome characters. Team Evil images are printed on the inside pages and High Anxiety faces are printed on the folded pages. The Team Evil pages are not revealed until the book is unfolded. The High Anxiety faces are folded as pages to be turned through. High Anxiety images are melting faces like "Drip Nose" while Team Evil are strong prints like "Eyebad." 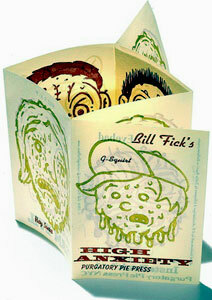 Bill Fick is a printmaker who lives and works in Chapel Hill, North Carolina. He is currently a Visiting Assistant Professor at Duke University in the Department of Art, Art History, and Visual Studies. Bill Fick: "Printmaking has a long tradition of narrative satire. My work follows this tradition while also drawing upon elements of comics, cartoons, and popular culture. Linocut is the perfect medium for making super graphic images." New York: Purgatory Pie Press, 2008. Edition of 144. 5.5 x 5.5”; 10 cards. Handset type and letterpress printed. Each postcard signed and numbered by the artist. Slipped in printed envelope with slip and slot closure. 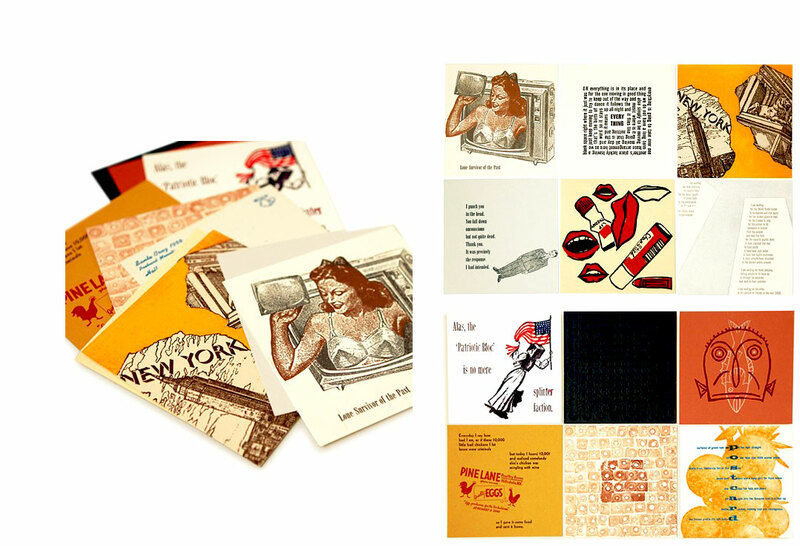 2008 post card series by Purgatory Pie Press. Designed with slits to construct a free form house structure. New York: Purgatory Pie Press, 2013. Edition of 75. 5" x 5" closed; 10 pages. Accordion structure extending from interior spine. Letterpress printed in red and black inks. Black paper boards with embossed titles on front cover. White spine panel with black title lettering. Square black image displays via a one inch square window in front board. Signed by printer and designer. Numbered. Esther K. Smith and Dikko Faust form increasingly complex abstract images by using only red and black triangles and squares. Purgatory Pie Press: "Faust and Smith collaborate, bouncing things back and forth. Starting with production limits -- press size, paper size, number of colors, and printings -- they talk about approaches, scribble something on paper. Faust hand sets the wood and metal type and proofs the words. Smith cuts the proofs and pushes elements around on paper cut to the size of the finished piece. Faust arranges that design on the press and proofs it. They tweak spacing, try colors, and papers." New York, New York: Purgatory Pie Press, 1999. Edition of 89. 6.4 x 3"; 4 books. Each is one sheet, accordion folded and hand-sewn into handmade paper cover. 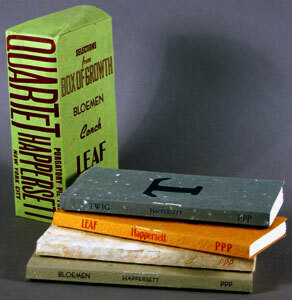 All four booklets cased in a handmade paper enclosure. Johannot rag papers. Bloemen: Bernhard Gothic type; Conch: Kaufmann Bold type; Leaf: Modified, Globe, and Alternative Gothic types; Twig: Weiss, Sylvan, and Hamilton Post Oldstyle types. Susan Happersett: "Many of the mathematical sequences in my work involve growth patterns. One series of drawings is based on the correlation between plant growth and the Fibonacci Sequence (1,1,2,3,5,8,13,21,34,...) I have also incorporated binary code, explored self-similarity, and chaos theory. Through these drawings I hope to reveal the grace and balance in the mathematics of nature and technology." Box of Growth is four handmade books, each about a particular occurrence of the Fibonacci sequence in nature: growth and decay patterns of sunflowers (Bloemen); the growth patterns of conch shells; the growth patterns of leaves; and the growth and decay patterns of twigs. The books use a visual language of grids composed of marks increasing in Fibonacci progression (1 line, 2 lines, 3 lines, 5 lines), arranged to represent patterns of growth and decay. All books use a similar abstract representation of the sequence, but each book uses different colors, fonts, paper textures, end papers, and layout on the final page — variation within pattern and repetition. New York: Purgatory Pie Press, 2007. Edition of 144. 5.5" x 5.5"; 12 postcards. Handset type and letterpress printed by Dikko Faust. Each postcard signed and numbered by the individual artist. 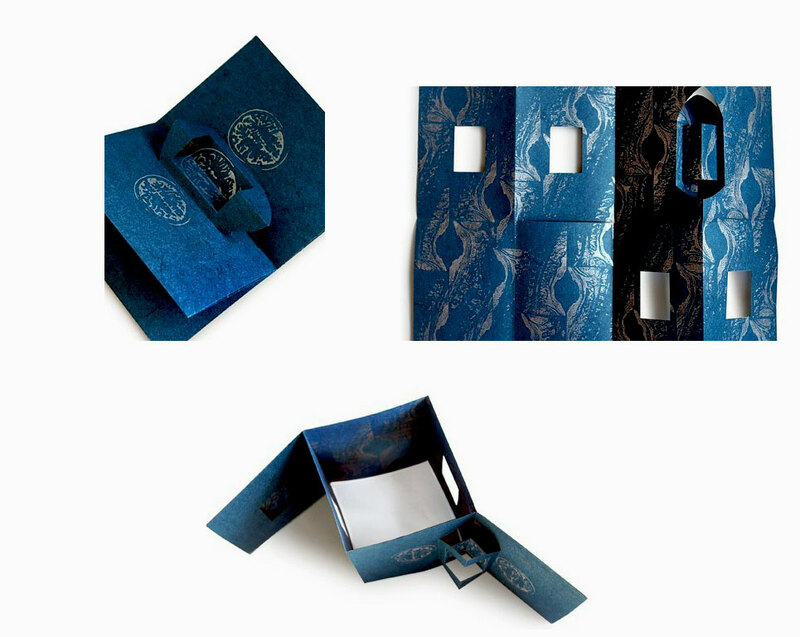 Laid in printed paper case with fold over flaps. Signed and numbered on the case by Faust and Smith. Square Postcards 2 was part of the annual subscription series for Purgatory Pie Press in 2007. Spinning Rebus by R. Mutt; linocut by Polly Faust.